Well that didn't take long for another "Music Keeps Me Spirited" post. I wanted to space it out, but well, I've been crushing on Justin Timberlake's "Say Something" song since right before the Super Bowl. It's a favorite with my boys, especially Whitt who loves to watch the video; over and over and over again. The music video is a work of art in its' own right. La Blogotheque, a Paris-based firm which has a collection of filmmakers, got this special project. It was shot in a single shot with live vocals also. No voice overs on this video. It's a truly live experience, and it feels like it too. It was filmed in the famous Los Angeles Bradbury Building, which was also the location for Blade Runner. As you'll see in the music video it has several elevators, balconies and stairs. The thing that I love most about the video and location is by far the elevators. I adore buildings with history. It was built in 1893 and obviously you don't see architecture or architectural details like this anymore. It takes you back to a grander time when fashion was always to the nines, when there wasn't messy hair and work out clothes. My guess is not too many of you have elevators in your homes. 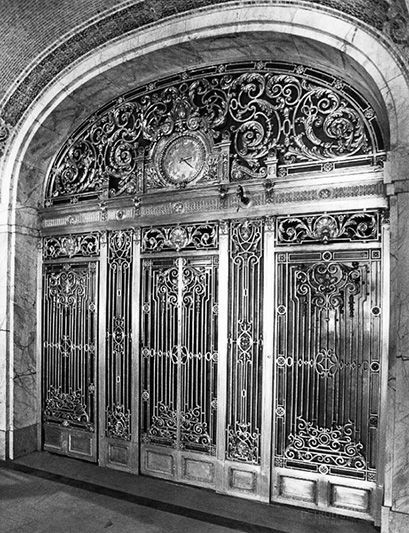 But I think the take away from these old, ornate doors is the details. Note patterns, are they ornate or have simple geometric patterns. I think you can pull parts from the doors and think about a pattern for floor tile or a pattern for wallpaper. 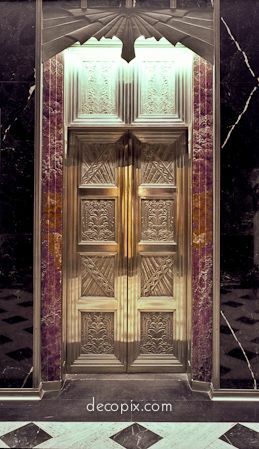 Maybe instead of going with a basic door for your powder room vanity, select a pattern and make that your door front. I also think this is a good reminder of what great finishes look like. You might be able to get a similar piece of furniture or lighting for less expensive than a designer piece, but most often with the lines that designers carry, their finishes far exceed what big box can do. Trust me, watch the "Say Something" music video. It will blow you away. note how the ceiling mimics the elevator shaft's pattern. I say if you're going to go for it, go for it! and that they did. Just look at that patina. another nod to art deco. A perfect pattern for walls or floors. look at that wood pattern and stain color! oh my gosh! just look at the size of that! I'm loving the mix of the gold with the black stone. black and gold, a classic combo.